This entry was posted on May 27, 2014 by Jessica Anderson. Another school year is coming to a close, with the anticipation of lazy summer days ahead. Now is the time to recognize learning and leadership excellence at your school for the past year. What awards will you be giving to your students? How much can you spend on the awards? Here are some tips and ideas for school academic awards; we have seen many come through our doors for the past 20+ years. I split academic awards into two categories: Contests and Achievement. 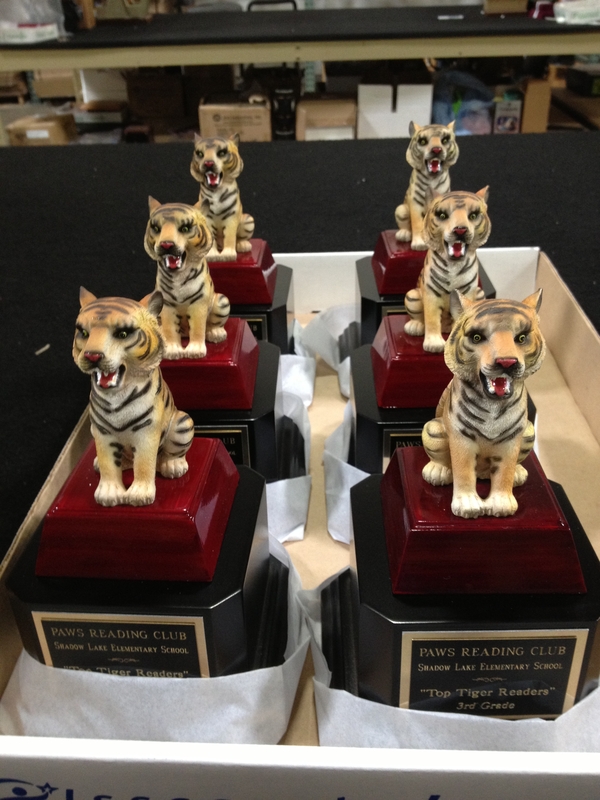 Tiger resin trophies for this school's "Paws Reading Club"- one for each grade level winner. The engraving says "Top Tiger Readers" - so cute! Common contests we see include Spelling Bees, Science Fairs, Reflections, Eager Reader, and Field Day. Below are ideas for awards. Certificates: These work for any contest and any budget. Just design and print on your computer. Easy and inexpensive! Ribbons: Relatively inexpensive and fun. You can customize these to your school colors and print them with your event info. Ribbons make great participation awards for your Reflections Art Contest, Science Fair and Field Day. However, ribbons do require additional time to produce; order at least 3 weeks before your event for customization; stock ribbon orders need less time. Trophies: Theme trophies exist for many events, such as spelling bees and science fairs. Also, mascot resin trophies are a popular choice for Eager Reader winners and Field Day. Medals: A variation on trophies, scholastic medals are inexpensive and easy to store at home. They are great for events where you have a first, second or third place winner. We have many medals with inserts for science fair, spelling bee, and school mascots, or design your own! Many schools have awards for Graduation, Students of the Month, Students of the Quarter, outstanding attendance, scholarship winners, etc. What do you give these students to honor them for their achievement? Depending on the age of the student, I would recommend different awards. Below are our most popular. For Preschool, Kindergarten and Elementary Schools: The most popular type of academic award for younger students is a Lamp of Learning. These come in many different shapes and styles, depending on your need and budget. Resin mascot trophies, especially bobble heads, are also popular with younger kids. 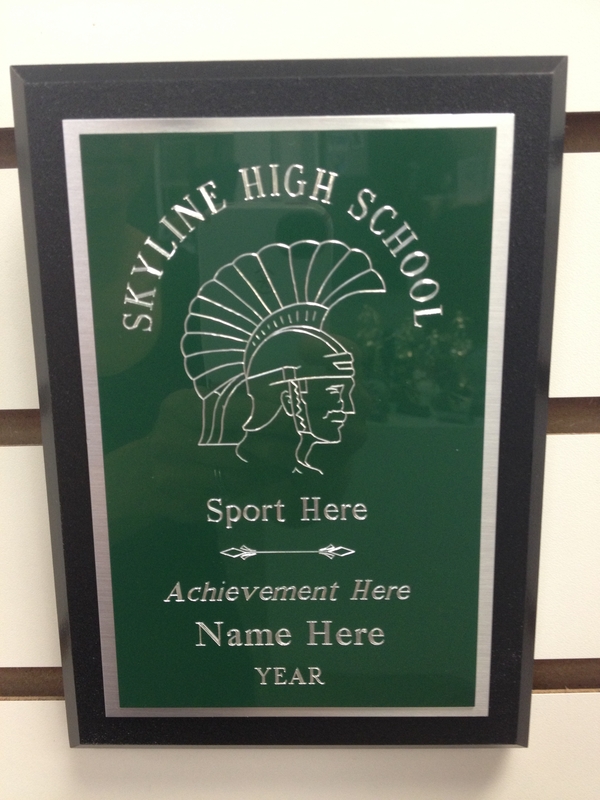 An example of a school themed plaque, popular for middle and high school scholastic achievement (and sports). For Middle and High Schools: The most popular academic awards for older students are school plaques. 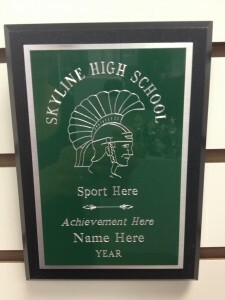 Using metal in school colors, these plaques usually have the school mascot engraved on top with the winner's name, achievement and date below. These are popular for Students of the Month, Citizen of the Year, Class Officers, and other larger scholastic and leadership achievements. In addition to awards, many schools host an assembly to honor students. This peer recognition is just as, if not more, important than the tangible award. Many schools publish the names of their award winners in the school or district publication. This can be online, in an Eblast, or in a hard copy newsletter. For larger community awards, such as scholarships or national recognition, students may be published in the local community newspaper as well. I hope this gives you some ideas of how to award academic achievement. Here's to another great school year! Wishing you a relaxing summer, full of fun!